Oh, Thanksgiving. I have a strange relationship with the feast that so many anxiously anticipate every year. Call me un-American but I’m just not too fond of the turkey, stuffing, mashed potato, and casserole feast. Side note: Stuffing was (and still is) “dressing” to me. I’ll blame my southern grandma for that one. People still look at me rather confusingly when I call it that. Maybe it’s because I come from a family of traditionalists and so we never changed a thing about the dinner. Every year it was the same - turkey, ahem, “dressing,” rice, giblet gravy, peas…..whoa, whoa, whoa. I know. Now I really have to explain. Yes, my Southern bred family “indulged” in white sticky rice instead of mashed potatoes, green peas instead of green beans, and giblet gravy instead of you know, the normal stuff. For those of you who don’t know what the heck giblet gravy is...it’s basically what it sounds like...and I swear, it’s not half bad. Still, I’m not obsessed. My brother shakes his head in total disbelief over my opposition to our family’s Thanksgiving recipes but, so be it. I’d make an Italian or Asian feast every Thanksgiving if there wasn’t a tiny part of me that still felt obligated to have some kind of “normalcy” with the day. But I will always enjoy mixing the feast up a bit with delectable goods that I didn’t eat every, single, freaking Thanksgiving for my entire childhood. Like, macaroni and cheese. Does it really get any better than the hot, melty, buttery, cheesy, carby goodness? I think not. It’s one of my favorite things in the entire world to gorge on. But since it’s Thanksgiving and all, it can’t just be regular mac-n-cheese. Nope, I had to really go all out on this one. Pumpkin 3-cheese mac-n-cheese with a sage butter Parmesan cracker crust, and crispy sage garnish. 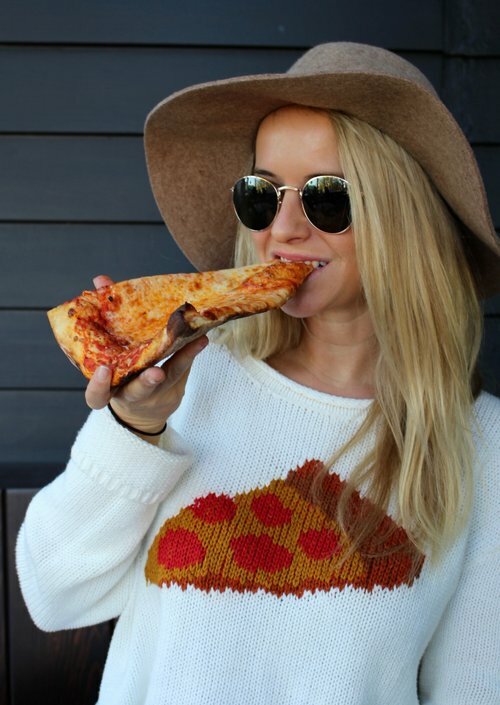 Because, it’s fun to go big, even if "big" is ridiculously gluttonous. *I must mention, I typically “under-bake” my mac-n-cheese. It’s a personal preference but I find that the standard 30 minute baking time can destroy the cheesy roux. It’s a risky game to get that perfect golden crust and frankly, it’s a game I won’t play. Heat the oven to 350 degrees. Bring a large pot of salted water to a boil. Cook pasta as directed and drain. Set aside. Melt 4 Tbsp. butter in a large saucepan, dutch oven, or cast iron skillet over medium heat. When the butter begins to bubble, add the flour. Whisk briskly for about 3 minutes until the butter smells nutty and the roux is a very light brown. Continue whisking and slowly pour in the milk. Keep whisking until the roux thickens. Season with a 1/2 teaspoon of salt, pepper, and nutmeg. Add the pumpkin puree and the cheddar, goat cheese, and ½ of the Parmigiano-Reggiano. Stir until the cheese has melted and the sauce is smooth. Taste the sauce for seasoning and adjust with more salt or pepper. Melt 1 tablespoon butter with sage on low in a saucepan. Stir and once light brown and nutty, take off from heat. Remove the sage leaves and then mix the butter with cracker crumbs and remaining Parmigiano. If you’ve used a Dutch oven or cast iron skillet, mix the cooked pasta directly into the sauce until well coated. If using a saucepan, transfer the pasta into a well-greased casserole dish - OR into 6-8 single serving dishes like I did. Top with the Parmigiano-Reggiano and cracker crumb topping. 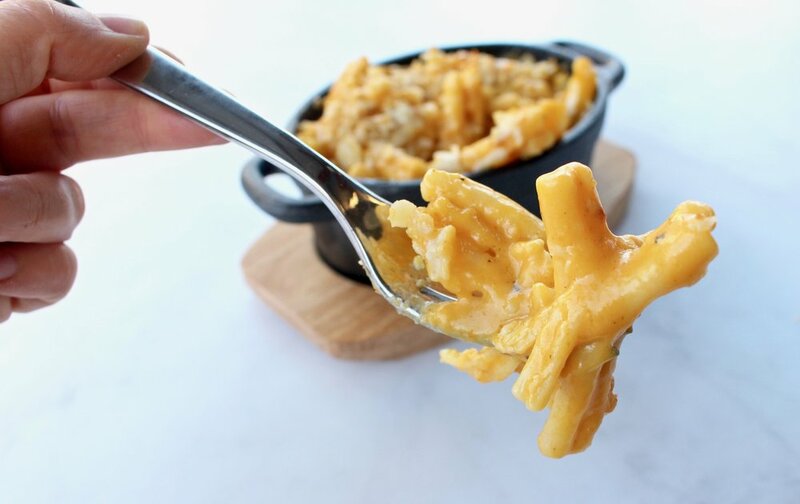 Bake the macaroni and cheese, uncovered for about 20 minutes or 30 minutes if you’re looking for a golden crust. Let stand 5 minutes before serving. While the macaroni and cheese rests, bring 1/4 cup olive oil to medium-high heat. When it begins to sizzle with a sprinkling of flour, add sage leaves for 2 seconds on each side, being careful not to burn. 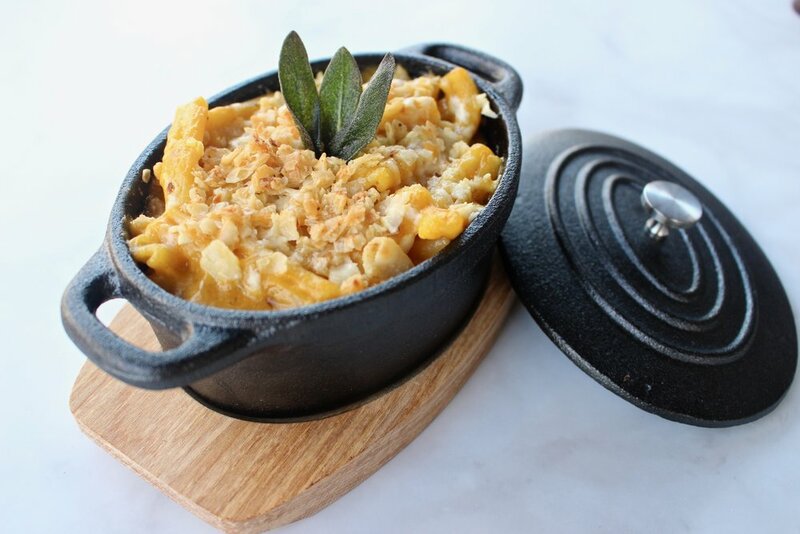 Garnish the macaroni and cheese with the crispy sage leaves.